Reports surface that West Palm Beach family physician Bruce Moskowitz, MD has participated in several planning calls with the VA/Cerner contracting team, and may in fact be responsible for its delay. Moskowitz, who has ties to President Trump’s inner Mar-a-Lago social circle, has been vocal about his dislike of Cerner’s software based on his use at two Tenet hospitals in Florida – technology deemed out of date by investigators from the VA’s Office of Information and Technology. 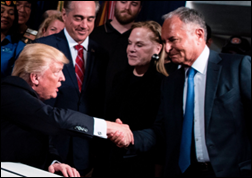 Moskowitz’s influence and that of Marvel Entertainment Chairman Ike Perlmutter, who has also been on the calls, reportedly rankled former VA Secretary David Shulkin, MD and clinicians involved with the EHR project. Their influence came to national light in 2016, when they helped to convene a hush-hush meeting at Mar-a-Lago between President-elect Trump and leaders from the Cleveland Clinic, Johns Hopkins, the Mayo Clinic, and Partners HealthCare. Responses to this week’s question are trickling in, with most emphasizing the tightrope managers must walk in firing someone that deserves it, but not being able to articulate the reasons why to the rest of the company for confidentiality reasons. I hope you’ll add your experience to the mix. Agfa Healthcare receives FDA 510(k) clearance for its DR 800 multipurpose digital imaging system. Enterprise telemedicine vendor InTouch Health acquires competitor Reach Health for an undisclosed sum. AMA invests $27 million in the Health2047 technology company it founded in 2016 with a $15 million investment. The company launched health data network Akiri (fka Switch) last year, and plans to develop additional companies in the areas of physician productivity, value-based care, chronic disease, and data exchange. 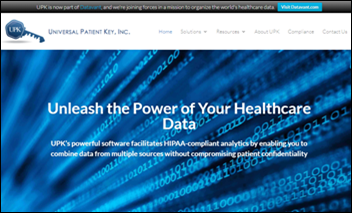 Health data management company Datavant raises $40 million and acquires data de-identification vendor Universal Patient Key. Former FDA CIO Eric Perakslis now serves as Datavant’s chief scientific officer. Lety Nettles (Baker Hughes) joins Novant Health as CIO. Omkar Kulkarni (Cedars-Sinai) joins Children’s Hospital Los Angeles as its first chief innovation officer. Clearwater Compliance names John Moore (PwC) chief risk officer and Richard Staynings (Cisco) chief security and trust officer. In an effort to keep up with the Apple and Amazon Joneses, Fitbit will use Google’s Cloud Healthcare API to share user data with providers via their EHRs. Providence St. Joseph Health (WA) launches a Virtual Health System comprising 50 telemedicine programs across 100 facilities in five states. UCHealth Yampa Valley Medical Center (CO) will go live on Epic in early May. Kaweah Delta Medical Center (CA) goes live on Cerner. The organization was due to replace its Cerner/Siemens Soarian system with Cerner Millenium in November 2017. Main Line Health (PA) integrates Bernoulli Health’s clinical surveillance, medical device integration, and data analytics platform with its EHR at four hospitals. The SSI Group adds patient payment management capabilities to its Access Management line of revenue cycle software. CDC Director Robert Redfield, MD asks for and receives a pay cut after reports surface that his projected salary of $375,000 was far above those of his HHS colleagues, including his boss, HHS Secretary Alex Azar. Redfield’s initial compensation was determined by the Title 42 salary program, which was established to attract top-notch researchers to government posts. 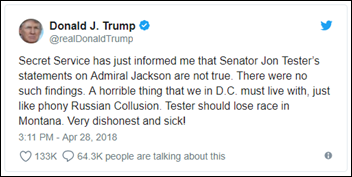 White House officials conclude that several of the allegations made against President Trump’s former personal physician and VA Secretary nominee Ronny Jackson, MD released last week by Senator Jon Tester (D-MT) are not true. Jackson, who withdrew his nomination after the allegations came to light, will stay on as an active duty Navy physician within the White House medical unit. University of New Mexico Hospital will implement Glytec’s eGlycemic Management System. The NHS will convert all devices to Windows 10 in an effort to prevent cyberattacks like WannaCry, which last year hit a third of its facilities and led to the cancellation of thousands of appointments and procedures. As part of its $1.5 billion transition to Epic this weekend, Mayo Clinic will activate 51 patient intake kiosks at its campus in Rochester, MN. This won’t be the health system’s first foray into kiosks. It tried out two HealthSpot telemedicine kiosks in 2014 to remotely serve a local school and employer. That endeavor ended when HealthSpot went out of business two years later. Pivot Point Consulting partners with Trinisys to help customers migrate their legacy EHR data to new systems. Clinical Architecture and CompuGroup Medical will exhibit at HLTH 2018 May 6-9 in Las Vegas. AdvancedMD will exhibit at APA’s annual conference May 5-9 in New York City. 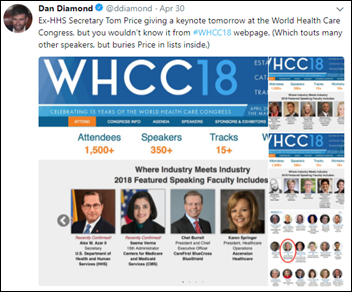 Docent Health CEO Paul Roscoe will speak at HLTH 2018 May 8 in Las Vegas. Casenet adds MCG Health’s Chronic Care Guidelines to its new TruCare Assessment and Care Plan Interface. Aprima and Surescripts will co-present at Asembia’s 2018 Specialty Pharmacy Summit May 2 in Las Vegas. Bluetree Network will exhibit at the 2018 Spring Hospital & Healthcare IT Conference May 2-4 in Atlanta. Datica CEO Travis Good, MD will present at HLTH 2018 May 6-9 in Las Vegas. Cumberland Consulting Group will exhibit at the NCPDP Annual Technology and Business Conference May 7-9 in Scottsdale. Vyne develops an exchange platform to help payers manage member-related communications. Medecision adds appeals and grievances monitoring, tracking, and management capabilities for payers to its Aerial product line. GCS Medical College, Hospital & Research Centre in India selects the eClinicalWorks Hospital Management Information System. ZappRx adds FDB’s e-prescribing capabilities to its specialty drug prescribing and prior authorization platform. Have to ask: Is Bruce Moskowitz,the next nominee to head the VA? I mean, he is a doctor after all and that qualifies him for pretty much anything. Also: Would blockchain have prevented Trump from writing his own medical assessment (“healthiest individual ever elected to the presidency.”)? I dunno guys, the idea of getting advice from people who have actually done this successfully probably had some merit. I’m sure Kushner has spent lots of money in his life, but that feels like where his relevant expertise ends. Agree, EE, but they shouldn’t just be asking questions to the best. They SHOULD be asking Cerner physicians at Tenet and other customers – not just the Cerner reference list. Find those folks and ask them if Dr. Moskowitz’s experiences sound familiar. Ask them how CommonWell is working for them. Ask them how easy it is to share with athena users, epic users, allscripts users. Then ask how effortless it is to connect to other cerner users. Ask them how their overall experience and cost compares to as-advertised. Then ask DoD pilot-site physicians and staff how it’s working for them. Ask how is productivity. Ask how is the data sharing with community providers and the VA. When the entire premise of the no-bid decision is the simplicity of data exchange and the wisdom of using the same DoD system – maybe we should pause to be sure that system works? I’ll grant that the idea of single system is an obvious and logical rationale, but only if the system does what it’s bought to do. Maybe they should just ask the folks at University of Illinois? Or perhaps Banner Health? Lead in story is a repost from a Politico article that fails to name sources. My my how politico this blog has become. The meeting in 2016 was reported as related to Obamacare, and healthcare reform, not about the VA.
Re: Epic Welcome Kiosk at Mayo …. does anyone have feedback on deploying the Welcome Kiosk? If you haven’t already purchased kiosks, check out Epic Welcome on tablets. They announced it during XGM this week. It was released earlier this year.